Transition from your bike to the produce aisle with this stylish pannier. 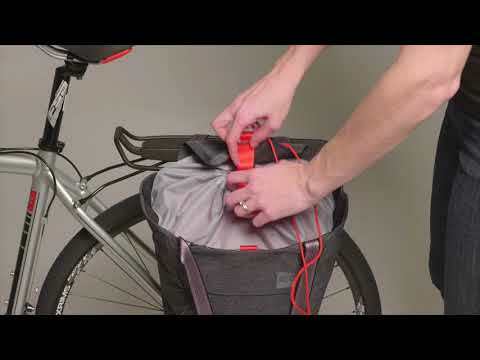 Carry it comfortably off the bike thanks to recessed pannier hardware and built-in tote handles. Inside pockets keep your phone and files or U-lock separated from your carrots and broccoli. Rixen and Kaul Modul attachment system has spring-loaded top hooks that adjust to fit rails from 8 to 16mm. A central locking mechanism keeps them in place. Internal draw string collar with fold over flap keeps weather out and lets you fill it to the top. Handy magnets keep the draw string adjustment cord in place as you pedal. Long webbing tote handles allow easy carrying off the bike.